Before the SUN Movement was launched, there had been growing global recognition of the problems of undernutrition, and concern that the international system was failing to deal with it effectively. Across 2008 and 2009 a spike in global food prices and the global financial crisis sparked global concerns for the world’s poorest populations and shed light on the cost of hunger and malnutrition. The High-Level Task Force on Food and Nutrition Security was established by the UN Secretary-General in 2008 and in the same year, the Lancet series on maternal and child nutrition provided a new evidence base for action on nutrition. It highlighted the high personal and economic costs of stunting and criticised the failure of a “fragmented and dysfunctional” international architecture to deal with it. A renewed media and policy interest combined with the 2008 Copenhagen Consensus – which concluded that nutrition interventions were among the most cost-effective in development – were drivers towards the rise of the SUN Movement. In 2009, the World Summit on Food Security brought Heads of State together to renew commitments to end hunger. 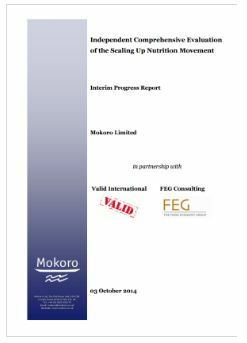 Around the same time, a collaborative process began which led to the development of the policy brief “Scaling Up Nutrition: A Framework for Action” published in the March 2010 issue of the Food and Nutrition Bulletin. The policy brief was endorsed by over 80 institutions following calls for endorsement led by the World Health Organization. The framework had both stimulated and reinforced political interest in nutrition among leaders of governments and development partners alike, and this continued with a meeting hosted by the World Bank in April 2010 (view photos) during the World Bank and International Monetary Fund Spring Meetings. 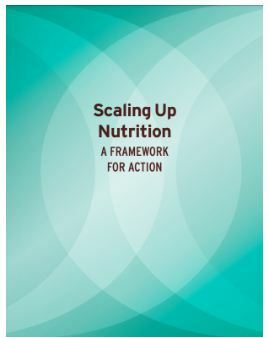 The first edition of the Road Map for Scaling-Up-Nutrition (SUN) was released in September 2010 and a UNSCN Nutrition Partner’s kick Off Meeting was held in Rome, December 2010. In June 2011, a meeting in Tanzania with Tanzanian Prime Minster Mizengo Pinda, promoted the 1,000 Days campaign which had launched at the MDG Summit of 2010 and the following day, Bread for the World and Concern Worldwide brought together hundreds of anti-hunger activists and nutrition experts in Washington D.C. to maintain the momentum for the SUN Movement and the 1,000 days initiative. The consensus of the global community was to tackle stunting, to focus especially on the 1,000 day window of opportunity and to embrace nutrition-sensitive approaches to tackle the underlying causes of malnutrition as well as nutrition-specific interventions to tackle its direct manifestations. They proposed that civil society, donors, UN agencies and the private sector should all collaborate to support country-led, multi-sectoral strategies to combat undernutrition. 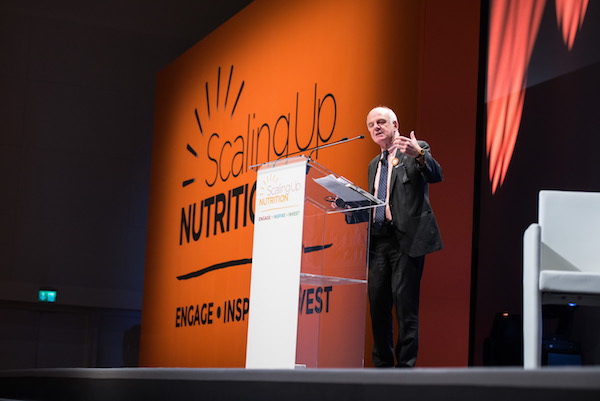 This was to be an informal partnership, and its role would be to catalyse support for countries prepared to “scale up nutrition”. Within a few months the Framework for Action had been endorsed by over 100 entities, and numerous countries came forward to participate. On the basis of a stewardship study which was conducted in 2011, SUN’s institutions became more formal. A high level Lead Group was established in 2012, supported by a Coordinator and Secretariat based in Geneva; operating under the auspices of the UN Secretary-General. 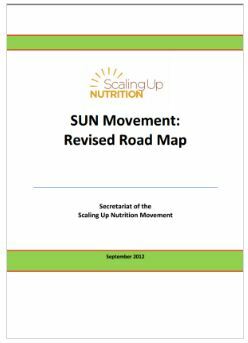 A Strategy 2012–2015 was published, and together with a Revised Road Map, it provided the guiding framework for the SUN Movement. On the basis of a stewardship study which was conducted in 2011, SUN’s institutions became more formal. A high level SUN meeting titled, “The First Year and the Future,” was held in September 2011, complemented by an extended SUN workshop which brought together speakers from 18 SUN Countries (later evolving to be the SUN Movement Global Gathering). A high level Lead Group was established in 2012, supported by a Coordinator and Secretariat based in Geneva; operating under the auspices of the UN Secretary-General. 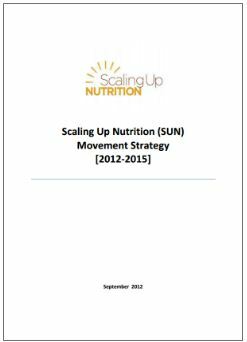 The Scaling Up Nutrition Movement Strategy (2012–2015) was published, and together with a Revised Road Map, it provided the guiding framework for the SUN Movement. 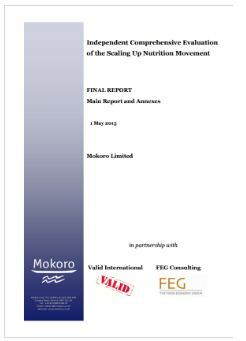 In mid-2014, the SUN Movement Lead Group commissioned an independent comprehensive evaluation (ICE) of the SUN Movement to assess the value it adds to efforts to scale up nutrition. 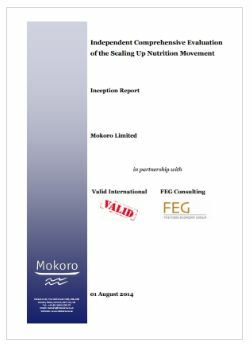 The evaluation, led by Mokoro Ltd and in collaboration with Valid International and FEG Consulting, helped examine the Movement’s efficiency, relevance and effectiveness. It looked at its institutional structures, ways of working and decision processes, and assessed the way the Movement is governed and its theory of change. The evaluation informed a visioning exercise for the Movements future strategy to ensure that the Movement is able to sustain political attention, encourage effective policies, stimulate the mobilisation of extra resources and catalyse the achievement of significant improvements in people’s nutrition.